*Very little is written, even by Fr. Andrew himself, about the Allentown and Dixonville parishes. If a reader has any information about either one, please get in touch with me. Right Reverend Andrew Stephen Slepecky, 81, pastor emeritus of St. Michael's Orthodox Church, St. Clair, died Sunday [October 31, 1976]. He had been ill the past year. Born in Czechoslovakia, he came to the United States in 1912 and entered the Orthodox Seminary at Tenafly, New Jersey, and was ordained in 1916 at New York City. He served parishes in New Jersey, Allentown, Uray, Dixonville, Oliphant, Nanticoke and at St. Clair from 1929 until 1975. Rev. Slepecky was an organizer of the United Orthodox Brotherhood of America and wrote many articles for the Russian Messenger Newspaper and for Swit and Pravda. Since 1949, he had been administrator of the Orthodox Church of America and spiritual advisor of the Federated Russian Orthodox Club and Frackville Deanery. Surviving are his wife, Anna Yasina; three children Mrs. William (Olga) Paul, Waretown, N.J.; Mrs. Michael (Elizabeth) Shandor, Silver Springs, Maryland; Dr. Ralph Slepecky, Syracuse, N.Y.; a brother and sister in Czechoslovakia; eight grandchildren and three greatgrandchildren. Rev. Slepecky's body will be in St. Michael's Church from 4 p.m. today where Parastas will be held at 7 p.m. by Bishop Herman. Burial services Wednesday at 7 p.m. at the church with Archbishop Kiprian and Bishop Herman Officiating with Hierarchal Liturgy 9 a.m. Thursday by Bishop Herman and priests of the Frackville Deanery. 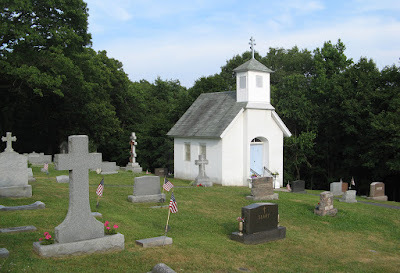 Burial in the parish cemetery. Cemetery chapel and grave of Fr. 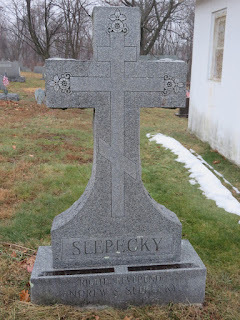 Slepecky in St. Michael's Greek Catholic Russian Orthodox Cemetery, Saint Clair. 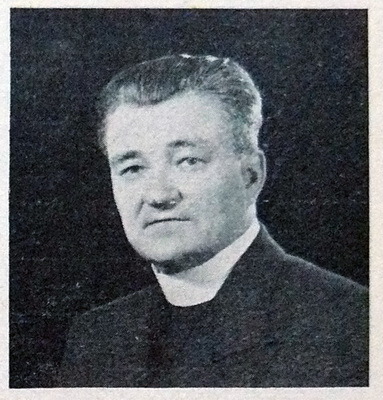 In 1948 Fr. Andrew published "Пряшевцы в Америке," an overview of the history of Carpatho-Rusyn immigrants in the U.S. from present-day eastern Slovakia, the so-called "Prešov Region." Fr. Andrew referred to them as "prjaševcy." The article appeared originally in the historical/literary journal Пряшевщина, published in Prague under the editorship of Fr. Slepecky's brother, Ivan S. Šlepec’kŷj. Thanks to the folks behind the Западная Русь site for putting the original text online. The emigrant peoples of Europe and other countries of the world make up the peoples of America. The start of the immigration of the prjaševcy in America dates back to 1880. It was necessitated by difficult living conditions and intolerable oppression on the part of the ruling foreigners. This migration was written of already in 1861 by the well-known Carpatho-Russian* activist Adolf I. Dobrjan’skŷj, who was already demanding rights of resettlement for the Carpatho-Russian people. Seeing the need of his people, Dobrjan’skŷj was seriously interested in the process of resettlement, and to become familiar with the living conditions of life in America he sent one of his villagers there as a special envoy to study the situation. Prjaševcy, leaving their homeland, settled in America in large cities and towns. They have chosen an urban life in New York, N.Y., Pittsburgh, Pa., Minneapolis, Minn., Passaic, N.J., Duquesne, Pa., Bridgeport, Conn., Auburn, N.Y., Nanticoke, Pa., Endicott, N.Y., Cleveland, Ohio, “Shanodor” (Shenandoah), Pa., Wilkes-Barre, Pa., Homestead, Pa., Philadelphia, Pa., St. Clair, Pa. and its vicinity and other cities and towns. To feed themselves and to help their relatives, they took on the most difficult work underground in coal mines, and in spite of a freer way of life, in the beginning they found it hard to get used to life in the New World. The first pioneers found themselves in a foreign land without knowledge of the English language, without experience or knowing how to apply their abilities to life here. This phenomenon greatly hampered their every undertaking, and many, having worked for several years underground, returned to their homeland with their earnings and, one might say, before the First World War, few intended to remain in the U.S. permanently. The emigration movement of prjaševcy to America, in fact, was the economic means to improve and strengthen their position in the land of their great-grandfathers. The fact reached people that hard work earned a lot of money overseas that immigrants sent back to their homeland, where with these funds they began to build new homes, acquired new agricultural tools and, in general, began to improve their living conditions. In addition, through constant communication with their families, via the press of American Russian* organizations among the people in the Old Country, a spirit of freedom was spread which emboldened the local Rusyn* population in their struggle against the oppression of foreigners. During the First World War, many prjaševcy were called to perform military duties and many of them were killed on the battlefield, and only a small number, not yet having U.S. citizenship, remained uninvolved in the performance of military duties. After the war, the situation changed in many ways. Prjaševcy, deciding to live permanently in the United States, started buying real estate, building their own houses, and now there are very few people who do not have their own property; many have already bought large estates that are in excellent condition. Remaining faithful to the precepts of their national awakeners: [Aleksander] Duchnovič, Dobrjan’skŷj, [Aleksander] Pavlovič, [Jurij Stavrovskŷj-]Popradov, [Ivan] Polyvka, and others, prjaševcy began to build their lives in a new country on old native traditions, striving for education, striving to have the Russian word and Russian culture, and without losing hope undismayed, their hard work has created and improved their social status, bearing in mind the popular wisdom: "Science and labor will conquer all." Many worked in the afternoon and attended classes in the evenings at public and at their Russian schools in the churches. All diligently worked to support their families, to help relatives in the Old Country and raise their children as exemplary citizens. Now prjaševcy send their children to public school and institutions of higher education, so that now many prjaševcy already have higher education: there are priests, doctors, lawyers, professors, teachers, mechanics, merchants. In towns and villages they already have their own as officials, placed in civil office by election or appointment. All are free to live their lives as they see fit. Of course, many immigrants from Prjaševska Rus’ still carry out heavy work, working underground in the coal mines. The prjaševcy born in the U.S. avoid this sort of work. At the beginning of the immigration what they missed most in their new domicile was what is so dear and valued to every Rusyn person; they longed for the Russian Church, the Eastern Rite, and, despite the fact that the well-established Western Rite churches were open to them, the prjaševcy were not satisfied and comforted in them. They were looking for an opportunity to build a life by their Russian church as it was in their native land. In the beginning, indeed, with great difficulty, they met in homes, even in the fields, serving the typika and other services, sang Russian songs and they so lived and soothed their inner feelings, their spiritual longing. 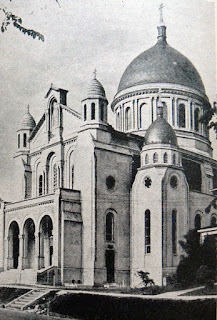 In 1884, in “Shanodor” (Shenandoah, Pa.) was built the first Russian church founded by Carpatho-Russians, and people from Prjaševska Rus’ were already playing a special part in the building of this church and the parish organizations. Soon after that, new Russian parishes were founded in Pittsburgh, Pa., Wilkes-Barre, Pa., Bridgeport, Conn., Kingston, Pa., Duquesne, Pa., St. Clair, Pa., and other cities, and people everywhere from Prjaševska Rus’ took and are still taking an active part. Throughout the churches soon began to appear Russian schools, which have bequeathed much spiritual wealth of the Rusyn people in the treasury of the American economic structure of life. Quickly the Russian Church in America has become the bearer of Russian culture and the defender of the traditions of the Rusyn people. In America there are more prjaševcy than in Prjaševska Rus’, where the Rusyn population is now more than 180,000 people. They are an energetic and hard-working, industrious people and their hard work is always in the pursuit of truth and justice. 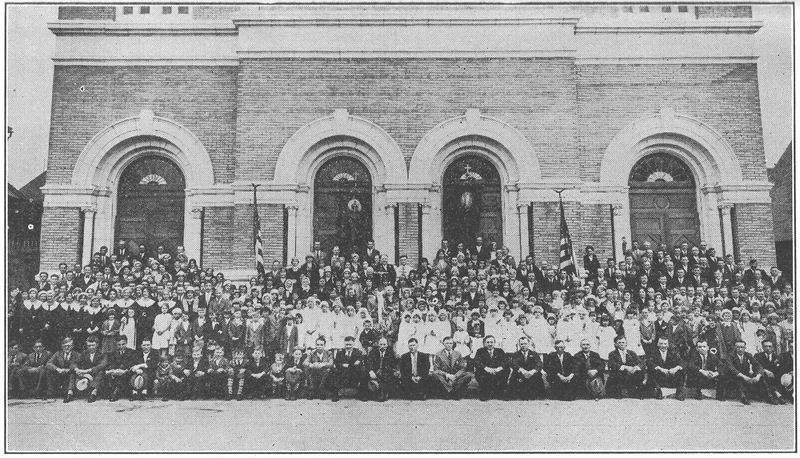 Knowing that only through organization can people strengthen their independence, prjaševcy created the Greek Catholic Union of Russian Brotherhoods (Homestead, Pa.), the United Russian Orthodox Brotherhood of America (Pittsburgh, Pa.), the Russian Orthodox Catholic Mutual Aid Society (Wilkes-Barre, Pa.) and the Russian Brotherhood Organization (Philadelphia, Pa.), and only the latter is now in the hands of Rusyn immigrants from Galicia. In summary: the natives of Prjaševska Rus’ have always stood, and most of them now stand for the unification of the Rusyn/Russian* people and the Slavs. 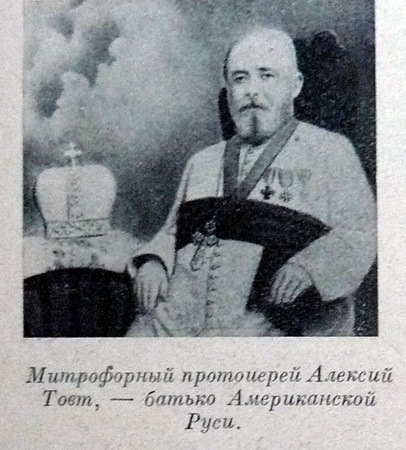 the "father of American Rus’"
Other parishes followed the example of the Minneapolis parishioners in defense of the Russian Church and its Eastern Rite, and then almost all of the then-organized Russian parishes reunited with the Russian Orthodox Greek Catholic Church and in the work of reunification the immigrants from Prjaševska Rus’ have taken an active part. Today there are 270 Russian Orthodox parishes that make up the Orthodox Church in America, and in many of them, the majority are immigrants from Prjaševska Rus’ and only a few parishes have no prjaševcy members. of St. John the Baptist in Bridgeport, Conn. 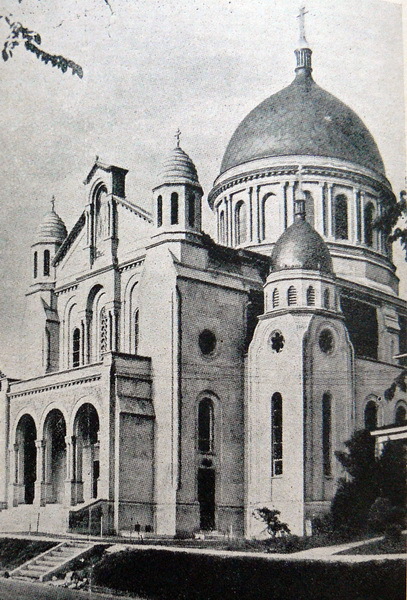 The last movement for reunification arose in 1935 as a result of strong pressure from the Catholic Church for Latinization of the Eastern Rite in the Greek Catholic Church also consisted mostly of immigrants from Prjaševska Rus’; an independent Carpatho-Russian Orthodox Diocese was founded with Bishop Orestes as its head. Of course, a substantial number of prjaševcy can be found in Uniate churches, now called just Catholic churches, but the spirit and commitment and these immigrants from Prjaševska Rus’ is directed toward the unity of Russians and Slavs. Only some of the Uniate clergy with their Magyar and Latin culture are alien to the Rusyn people, and have a different mindset than their faithful, and only this part of the clergy, carrying out the orders of the Catholic Church, conduct Latinization of the Uniate Church. The faithful, seeing all this, try not to get involved in church affairs, but still try to preserve their national identity. In short, the immigrants from Prjaševska Rus’ are not left behind. Their hard work has contributed many spiritual values ​​of the Rusyn people to the treasury of spiritual values ​​of all the peoples of America. And now they stand for the protection of the general public interest, but nevertheless the protection of Russian culture is their direct national goal. In World War II prjaševcy took an active part in the struggle against the aggression of the Germans and the Japanese, fought on all fronts in the U.S. Army, Navy, and Air Force for freedom, peace, justice, and a better future for all peace-loving peoples of the world. Many were killed on the battlefield, many returned home crippled, many returned with honors. In the fulfillment of military duties prjaševcy were confirmed in their quality: they are brave and skilled soldiers and officers. On the battlefield they were also priests, doctors, lawyers, mechanics, etc. Prjaševcy were in all departments of military production. On the home front females contributed not only as nurses but also as secretaries of military institutions and participated everywhere women could be of help in the military effort. Now prjaševcy take an active part in the restoration of peaceful life in post-war America. At the same time they do not forget their native land – Prjaševska Rus’. Many are still homesick and are willing to do anything to help their brothers in war-ravaged Prjaševska Rus’. They always keep a living connection not only with their relatives, but also with public figures of Prjaševska Rus’ and thus they mutually strengthen their national spirit and live a common spiritual life, the life of their ancestors, grandfathers, and great-grandfathers. As much as they are able, they are trying to help their brothers in Prjaševska Rus’ also in the social sphere. From every need and misery quickly arises patriotic feeling, a sense of duty to family and the Old Country and they promptly extend a helping hand. Prjaševcy have a considerable desire for sacrifice even now. Without any political obstacles prjaševcy would long ago have fulfilled their patriotic duty to the war-torn native land. Of course, too, the very nature of prjaševcy would not allow them to leave their brothers in the Old Country to fend for themselves. They look for and, of course, always find an opportunity to help our united Russian and Orthodox cause in Prjaševska Rus’. Prjaševcy in America showed themselves as strong in spirit, a fighting people resolute in character. The precepts of their ancestors, Russian traditions, their Russian ancestral Orthodox faith, the Russian Church and its Eastern Rite – all this is for prjaševcy a majestic and invaluable wealth. They live by this wealth and trying to preserve their national identity in its original form, everywhere they enjoy the great treasure of spiritual values of the Rusyn people, of Russian culture. 1. Prjaševcy – literally, people of Prešov/Prjašev/Prjašiv or “people of the Prešov Region” (i.e., present-day eastern Slovakia) – is used by the author to refer specifically to people from that area who are Carpatho-Rusyns. For the sake of efficiency, we retained his original expression throughout without translation. 2. Where the author wrote Prjaševskaja Rus’ we translate it as Prjaševska Rus’ which was fairly common parlance among Rusyns in the United States in past decades. It has no adequate translation in modern English writings; “the Prešov Region” is an approximate equivalent but lacks the emphasis that what is being referred to is the Rusyn-inhabited portion of the region and not the entire geographic or political territory of the Prešov Region/Prešovský kraj. *The author used russkij in the original, but was clearly speaking of Rusyns rather than Russians from Russia proper. When the author was referring to institutions, we have translated the adjectival form as Russian to accurately reflect his viewpoint. However, given that the Carpatho-Rusyn people are not Russian in a modern sense, regardless of his point of view on that, for clarity and modern context we translated russkij narod as “the Rusyn people.” Where he used karpatorusskij we have translated it as Carpatho-Russian, which is how the author usually referred to his people in English. In one instance when he wrote of the "unification of russkogo naroda and the Slavs" we translated it both ways, since his exact meaning was unclear. 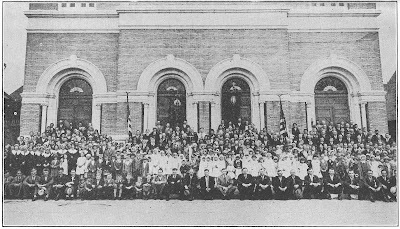 Parishioners of St. Michael the Archangel Church in St. Clair, Pa., after the solemn blessing of the bells, 1932. Fr. Andrew Slepecky, pastor; John Obletiloff [Obletila], teacher-choir director. Original material is © by the author, Richard D. Custer; all rights reserved. Rich Custer, as always there are these references to Russia and our identity to Russian culture or origin. Only in 3) notes did the statement that Rusyns are not Russians, When the author was referring to institutions, we have translated the adjectival form as Russian to accurately reflect his viewpoint. However, given that the Carpatho-Rusyn people are not Russian in a modern sense, regardless of his point of view. Even now some priests from the seminary years of the 50" and 60"s profess we Rusyns are Russians in ethnicity beause we are all the people of Rus or Russian. I hear this from the retired priest, Monsignor Alexis Mihalik all the times I talk about the Rusyns. Somehow the glory and influence of "Mother Russia" is so appealing to Monsignor. He once showed me an article where the Greek Catholic Seminary in Pittsburgh was planning on being called back to Russia to teach and establish the Greek Catholic Rite in Russia . Thanks for your comments, Anonymous. I'm not clear whether your implied criticism is of the post itself or of Fr. Slepecky's Russophile/Russocentric views. Let me be clear: I subscribe to the view that Carpatho-Rusyns are an independent, Eastern Slavic nationality. Despite that, unlike some authors I do not dismiss the value of historians of Carpatho-Rusyn background who have held other views. I welcome your feedback, inquiries, and suggestions. Hostile or off-topic comments will not be approved. Banner image: Alden Station, Luzerne County, Pennsylvania. Contact the author at rusynsofpa@gmail.com. The Subcarpathian Ruthenians Exodus to a "Promised Land"
Original material ©2014-2018 Richard D. Custer. All rights reserved. Picture Window theme. Powered by Blogger.